One could argue at length why the Press chose to do a series of the DeVos and Van Andel Foundations, a series that practically canonizes them, but I believe it is more important to point out the grave implications that the Amway co-founder’s “giving” has for democracy at home and abroad. To its credit, the Press did obtain the documents that lays out for us the details of which groups received funds from the tow foundations. To not question the integrity and motivation of the organizations receiving these funds however, is just bad journalism. It is bad enough that the Press did not explain how this “giving” is simply a major tax write off, but to treat the foundation money simply as promoting Conservative and Christian causes is very dangerous. Indeed, it fails to present the very deliberate and conscious effort of the Amway co-founders to promote policies that have resulted in limiting people’s access to equality, denied religious freedom, and in some cases, caused the murder of innocent people. What follows is a look at some of the more prominent organizations that have received money from the DeVos and Van Andel Foundations. The DeVos Foundation alone gave nearly $14 million over the past seven years to this Florida-based church. Aside from telling us that DeVos and Coral Ridge pastor James Kennedy play tennis, the Press f=gives us little substance on what role Kennedy plays in the Religious Right across the country. James Kennedy was an original member of Jerry Falwell’s Moral Majority organization, a group that has promoted anti-gay policies/anti-gay violence, the notion that women should be submissive to men and that the State of Israel should receive complete support from the US. 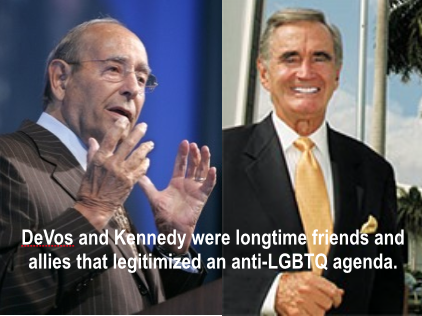 Kennedy also serves as a spokesperson for the Promise Keepers and has been a board member of the Coalition for Religious Freedom, a front group for the pseudo-fascist Rev. Moon. Kennedy, who also hosts a national conference, Reclaiming America, has a weekly TV program that airs on 360 stations and five cable networks in the US and Russia, as well as the Armed Forces Network. His 30-minute radio show, Truths that Transform, is heard six days a week on over 300 radio stations. Thus, Kennedy has unlimited access to promote his anti-democratic doctrine. Closer to home the Michigan Family Forum (MFF) promotes hatred towards the LGBT community, has close ties to Gov. Engler and has been creating political action committee in churches across the state. In his book, The Religious Right in Michigan Politics, author Russ Bellant states that MFF works closely with James Dobson’s Focus on the Family to organize Community Impact Communities. Standard reading material for these groups are Randall Terry’s Operation Rescue, a fanatically anti-choice text and Fr. Enrique Rueda’s, Gays, AIDS & You, which teaches hate towards the LGBT community. Another author recommended is Paul de Parris, whose name appeared on a letter endorsing the murder of Dr. David Gunn by anti-abortionist Paul Hill in Florida. Because of their political organizing, Gov. Engler has involved MFF in the Michigan Abstinence Partnership, sponsored by the Michigan Department of Public Health. They are also represented on a review committee working on curricula for AIDS/HIV with the State Department of Education. A major recipient from both the DeVos and Van Andel Foundations, the Heritage Foundation is the most active think tank in the US that promotes anti-democratic values. Founded in 1973 by beer baron Joseph Coors (a close friend of DeVos), this organization has promoted White Supremacy and a contempt for the poor. From 1973 – 82 the Chairman of the board of the Heritage Foundation was former Congressman Ben Blackburn, who said, “voting was not an inherent right but a privilege that should be qualified by some sort of literacy test.” In testimony before a House committee Blackburn advocated for publicly hanging housing tenants who fell behind their rent payment. Most notable has been the Heritage Foundation’s promotion of conservative economic programs. They wrote the incoming Reagan administration’s policy guide, Mandate for Change, that advocated for the elimination of Food Stamps, Medicare, child nutrition assistance, farm assistance, legal services for the poor and the repeal of a $1,000 tax exemption for the elderly. Heritage’s current director is Ed Feulner. Feulner has been a member of numerous organizations that have supported dictatorships throughout the world. He is a member of the World Anti-Communist League (WACL), which has toes to several death squads in Latin America and the Free Congress Foundation, which is another recipient of DeVos Foundation money. These three organizations have missions and board members that overlap. 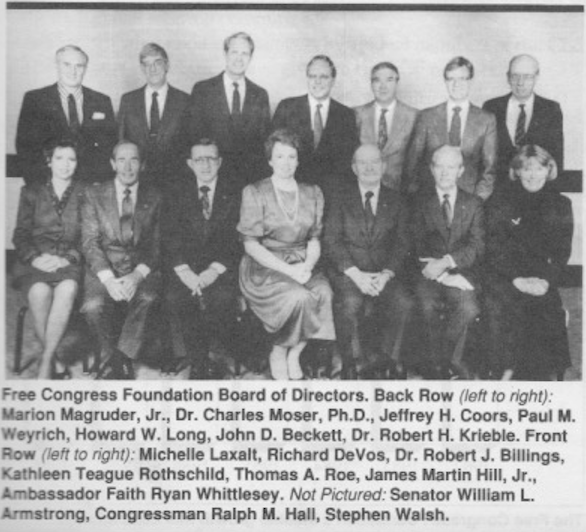 Rich DeVos even served as a board member of the Council for National Policy (CPN) at one time. All three groups have supported US foreign policies that have resulter in the deaths of thousands of innocent civilians. The Free Congress Foundation (FCF) actively supported the Contra terrorist forces in the 1980s in Central America, the Chilean dictator Augusto Pinochet and Islamic fundamentalist groups in Afghanistan, all of which committed massive atrocities against civilians in the 1980s. According to author Russ Bellant, FCF’s Paul Weyrich has also involved the organization in the World Anti-Communist League, CIA covert actions and support for Eastern European Nazi collaborators. The CNP is an organization made up of people like former drug and gun runner Oliver North and R.J. Rushdoony, a Christian Reconstructionist who believes that children should be given the death penalty for disobeying their parents. This group chastised the reagan administration in the 1980s for not being supportive enough of the South African Apartheid government. One board member, Don McAlvany, while on a trip to South Africa in 1989, suggested that someone might want to kill Archbishop Tutu. In the US, the CNP promotes the theories of groups like the Pioneer Fund that believes that Blacks are genetically inferior to Whites. The Conservative Caucus (CC) is headed by Howard Phillips, who has for years maintained close ties to the John Birch Society. The CC has been involved in many of the same causes as the CNP and the FCF, but one country’s politics has been dear to them for years. Angola has been at the center of the CC’s foreign policy concerns for years. CC has backed the terrorist Jonas Savimbi, leader of the group UNITA. UNITA has one of the worst human rights records in all of Africa, according to both Amnesty International and Africa Watch, and has been a political tool of numerous US administrations from Reagan until today. Phillips and the CC have been lobbying Congress for years in favor of UNITA. Other noted recipients of the “untold million” from the DeVos and Van Andel Foundations are Hillsale College. The President of Hillsdale College, George Roche, also sits on the advisory board of the US affiliate of the World Anti-Communist League. This educational institution has hosted forums with speakers such as Manuel Ayau, a member of Guatemala’s Amigos del Pais, a group linked to the death squads in Guatemala. Hillsdale also houses the late John Bircher Clarence Manion’s tape collection, with lectures from former Nicaraguan Dictator Anastasio Somoza Hillsdale’s magazine, Imprimis, provides a forum for anti-minority views. In one issue they gave space to the director of English Only (another DeVos and Van Andel Foundation recipient) to condemn advocates of cultural diversity and bilingual education. This compliments foundation money that goes to TEACH Michigan and the Mackinac Center for Public Policy, which are militantly anti-Public Education groups. This is only a sampling of the groups that both the DeVos and Van Andel Foundations have contributed to. 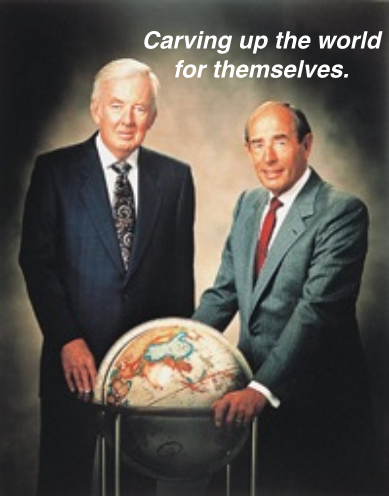 Even if a small dose of this information had appeared in the GR Press, at least the public would have more to go on before the Amway co-founders were given sainthood. This entry was posted in Indy Media, Religious Right and tagged DeVos & Van Andel funding the far right, DeVos and anti-LGBT policies, DeVos and English Only, DeVos and the Pioneer Fund, DeVos and Van Andel funding the religious right, Jay Van Andel Foundation, Rich DeVos Foundatio. Bookmark the permalink.